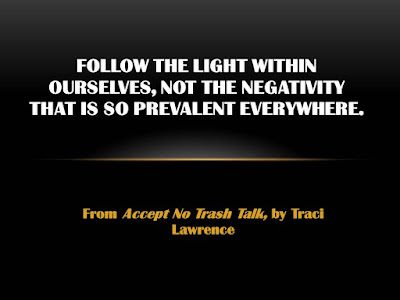 As I discuss in my book, Accept No Trash Talk, numerous people today are more concerned with the opinion of others than with the guidance of their own intuition. Since much of the world is full of trauma and drama, that can be counter-productive. For instance, I read about the brother of a celebrity who refused to attend his sibling’s wedding because he felt that the press would ridicule his appearance. What is “the light within”? Joe Carter, an editor at the gospelcoalition.org, wrote an article entitled: “What is conscience”, in which he suggests that conscience is an internal rational capacity that bears witness to our value systems. It is a built-in warning system. It is built on biblical teachings. Swami Rama, in an article entitled: “Guru and the Light Within” on swamij.com, states that the Lord, the reality, the truth is always within us. The light of consciousness is within us. It will guide us. We should be aware of our power. We should make efforts to work with ourselves. Supreme Master Ching Hai, in an article entitled “What is Enlightenment?” on godsdirectcontact.com, suggests that everyone has a higher power within themselves. She says that “enlightenment” is the process of knowing what is greater than life, the art of embracing the light within one’s self. An article on essentiallifeskills.net entitled “Have a Personal Value System” suggests that “the inner light” can be defined as a personal value system. It is a set of principles or ideals that drive and/or guide our behavior. It gives us purpose and structure. It helps us to determine what is meaningful and important to us. It’s obvious that “the light within”, or conscience, can be universally described as a value system that points to an inner place of great inspiration and self-knowledge. If every person is gifted with such an internal standard, why should some people believe that they have a right to dump their negative attitudes on other people? In addition, why would some people feel that they need to accept others’ pessimistic attitudes? Why should we be allowed to follow our inner light? We are all born with inner light; we just have to connect with it. Other people are not our judges, outside of ecclesiastical and judicial authorities. What fits within others’ framework of abilities and background may not fit within our own. We’re all imperfect, so how can one imperfect being judge other imperfect beings? How can we follow our inner light? Distance ourselves from external negativity. It may be possible to switch social groups. If one group seems to demean us in any way, we can choose to associate ourselves with a group that is more accepting. Make our own home and workplace as peaceful as possible. Every person may have their own method of making a peaceful atmosphere in their homes. Some people choose to limit electronics, or electronic usage. I have a friend who says that she has stopped listening to the news because it is always pessimistic. The same lady says that she is also limiting her time on social media because of the proliferation of foul language and negative posts. Keep our minds in a state of peace. Joyce Meyer , Joseph Prince, and others suggest: “If you can’t do anything about it, let it go.” The Christian extension of this would be: “Let go and let God.” A prime example of letting go relates to teenagers. Any parent of a teenager, such as me, can confirm that many teenagers today do not want to listen to anyone in authority. They are stubborn, and they think that they know everything. The parent needs to make a choice on whether to get upset over a condition that they seem to have no power to change. Identify and accept our unique needs and wants. Emotional needs as well as medical and academic challenges may vary from person to person. We need to allow ourselves to deflect judgment in areas where we might not have the resources to be as capable as other people. For instance, I may be judged because I have not been able to buy clothes for myself in years, but I do not have to accept that judgment.